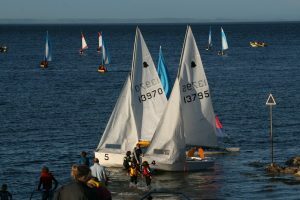 Bright Nights Sailing 2019 – Registration Evening : Friday 17th May @ 7pm in the clubhouse. In association with the Sport NI “Active Clubs ” program supported by the RYA in Northern Ireland, DSC will be running the Bright Night sailing starting on the 31st May 2019. You will have the opportunity to get out on the water with our experienced helms and learn some of the basics of sailing while have great fun with like minded juniors. As this is not a drop off program, we require that a parent remains on the shore or in the club house during the session. A BBQ is held in the Club after sailing and all participants can relax and socialise over some light refreshments. Participation is completely free for members, non-members can join at the Registration evening, and have a 2 week trial period, see below for details. With club membership you can avail of the discounted rates for all the training courses held through the year, as well as joining in the many events throughout the year. A registration evening will take place on the 17th of May in the club house at 7pm. The evening will be divided into two sessions one at 7pm and one at 8pm. Participants will need to book on a week by week basis via the Club website and will be on a first come basis. The 17th of May will also be a COMPULSORY refresher course and information evening for all helms wishing to participate on Friday Nights. Friday Nights will run from the 31st May until the 23rd of August.